Cucumber pancake is also known as tavshyachi bhakri in konkani and kakdiche thalipeeth in marathi.Tavshe and kakdi standing for cucumber in konkani and marathi respectively.This is a nice variation to the typical thalipeeths/bhakris.This recipe is very simple and can be made within no time for breakfast or evening snacks.This is a savoury version, shall post the sweeter version sometime later. Wash the cucumber and grate it along with the skin. Chop the onion and green chillies finely. To the rice flour add the grated cucumber,onion,chillies,salt and freshly chopped coriander leaves. Add water as required to get a desired thalipeeth consistency. Grease it with some oil. 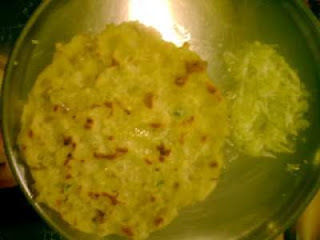 Take a portion of the above mix and pat it with your hands gently to form a roti. Apply some water to your hands so that it doesnt stick. Sprinkle oil on the sides and let it cook. Flip it on the other side and cook.